To the best of my knowledge, there are no murderers in the part of the family tree that leads directly to me. I have done my best to maintain this streak of successfully not murdering anyone, but if I am ever accused, I will not be the first person named Mark Aldrich to be charged with murder. Some history: Almost every person with the last name Aldrich in the United States is descended from George Aldrich of Derbyshire, England, a tailor who was born in 1605 and emigrated to America in 1631, a decade after the Pilgrims. He is my (deep breath) great-great-great-great-great-great-great-great-great grandfather and probably the only one of those whose name I will know. George and his wife Katherine Seald Aldrich settled in Dorchester, Massachusetts, had 10 children (one, a daughter who died in infancy, bore a classic Puritan name, “Experience Aldrich”) moved to Braintree, and then moved to Mendon, Massachusetts, where his name is inscribed on a monument naming the town’s first settlers. I have not visited this. His second son, Joseph, is the great-great-great-great grandfather of Rhode Island Senator Nelson Aldrich, whose daughter Abby married John D. Rockefeller II and was the mother of several prominent Rockefellers. One son, Nelson Rockefeller, carried “Aldrich” as his middle name. He was governor of New York when I was born, but these two facts are not connected. Another son, Jacob, had a dozen children, and those from his son, Joseph, were early settlers (in the 1740s) of Mattituck, on the east end of Long Island, and the Tafts—including President Taft—are a part of that Aldrich family line. One of Jacob’s other sons was named Peter, born in 1686, and he is my direct ancestor. My own branch of the Aldrich family tree did not move far over the centuries: my own grandfather was himself from Massachusetts. The speedy proliferation of Aldriches in America—when ten children have ten children, as happened with George and Katherine Seald and then their brood, the family tree develops many branches on it from the start—can make genealogical research a challenge. The family histories I have read have notes like, “Jacob (2) and Jacob (4) both had sons named Jacob who married wives named Sarah. Or they are the same Jacob.” I exaggerated that a little bit. A friend of mine who does genealogical work reported a find to me recently: He uncovered a family history in which a grandson was seven years older than the grandfather. Slip-ups happen when all one has is documents and not lives. Mark Aldrich. Not the me Mark Aldrich. The other Mark Aldrich. The deceased was seventy-one years of age. He was born in the state of New York, but subsequently settled at Warsaw, Hancock County, Illinois. We know but little of his early history, but are informed that he was three times a member of the Illinois Legislature, and served with Lincoln, Douglass, and other distinguished men who have since written their names high on the roll of fame. He came to California in 1849, and we believe engaged in mercantile pursuits. Of his history while there we are not informed. He came to Arizona in the latter part of 1855, and has since resided in Tucson. He was the first American merchant in this town, the first postmaster, and the first alcalde. “Mercantile pursuits” in California in 1849? Whatever might those have been? Hmmmmm. That was the year the Gold Rush started. These two things might be connected. This Mark Aldrich is not even 50 and he is a part of the Gold Rush, and later he becomes the first alcalde of Tucson? “Alcalde” is spanish for “Mayor,” so he was the first American mayor of Tuscon, Arizona. I’m feeling defensive about my comparative lack of achievement with my 47 years. “The Gad About Town” won Best Humor Column at the New York Press Association’s 1997 Better Newspaper Awards, okay? In 2000, I moved part-way cross-country and back. It was for gold, too. A technical writing job. Hancock County, Illinois, in the 1830s was where Joseph Smith had led his followers in the nascent Latter Day Saint Movement. Aldrich tried to sell Smith and his followers some land that he owned but Smith did not purchase it. After renting the land, however, Aldrich turned into one of the worst landlords—or the best, from the perspective of Mormon history and how/why they emigrated west—still, he was unfair: he started changing the terms of the lease at whim. Increasing the rent. Making demands. 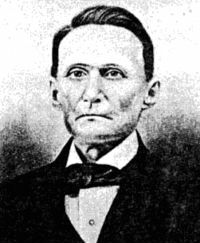 Smith and the early Mormons had enough of this, broke the lease, moved away, and founded what became Nauvoo, Illinois; Smith named himself mayor of the new community and then he announced a run for President of the United States. He was ambitious. Aldrich declared bankruptcy. Nauvoo is in Hancock County, the same county that Aldrich’s land had been on. Now an angry former landlord, he became a vocal opponent of the incipient LDS movement. Aldrich is also one of those figures that one still sees a lot of in small-town America: he seems to have always been in at least one elected or appointed official position wherever he resided, all the way from postmaster to state legislator sitting next to Abraham Lincoln to alcalde of Tuscon years later. At this particular time, he was a major in the Illinois State Militia, and in June of 1844, Joseph Smith had been arrested and was being held in the Carthage City Jail. The Illinois State Militia supplied guards for the jail. Aldrich, a militia major with men under his command who was present for the events that night, was charged with murder along with four other men. A trial was conducted and an all-non-Mormon jury acquitted the five after very brief deliberations. The whole matter was such a non-issue that Aldrich ran for sheriff of Hancock County, Illinois, the very next year. Within a decade after this story, Aldrich had moved to California and then he was an early settler of Tuscon and its first American mayor. He was 71 when he died. And his body is, to this day, buried under the streets of Tuscon. (Needle scratch sound effect, again.) The cemetery in which he was interred was closed by 1890 as that great city grew into city-hood and paved things. Most peoples’ remains were moved to other locations in subsequent decades but no record exists that states that any Aldrich relative from anywhere in the country ever claimed the body of the former mayor and the accused-but-acquitted murderer of the founder of the Mormon Church. The remains of Mark Aldrich, the one who is not me, and many others are assumed to have remained in the closed cemetery. The former cemetery is now part of All Faiths Memorial Park Cemetery. The fact that it was a cemetery and still is a cemetery, but for unknown individuals, is noted. If I ever visit Tuscon, I must visit this park. This is a re-written version of a column from 2014 and 2015.